While there are the obvious industries and outlets that put women in the minority, if at all (congressional seats, music festival headliners, everything), some patterns are not as crystal clear until you see them put them together. Now there’s a Tumblr that points out the extreme lack of female representation, particularly in the world of lecture panels. There goes that patriarchy, patriarchin’ again. The All-Male Panels Tumblr is a visual sausage party documenting “all male panels, seminars, events, and various other things featuring all male experts” through submitted screencaps. 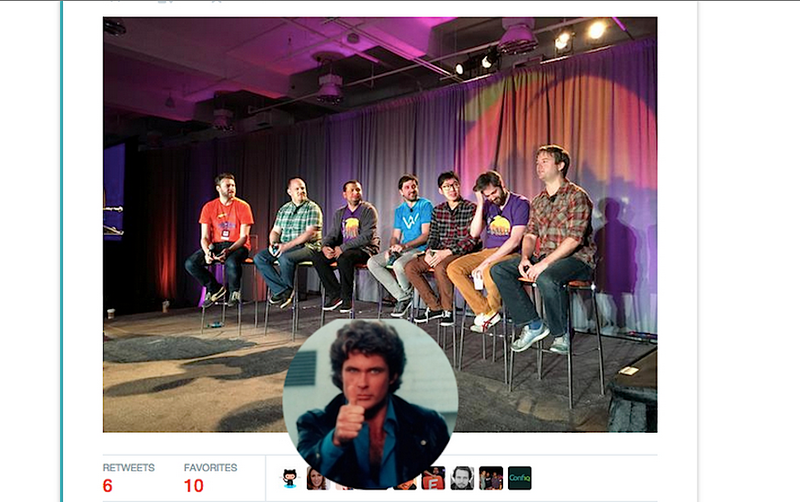 There are photos and screenshots of testosterone-filled workshops, lectures and summits all around the world, each stamped with a photo of David Hasselhoff. Why? Probably because The Hoff is one of the world’s truest masculine icons. As funny as this Tumblr is, it’s also depressing to see all these balls occupying expert roundtables without a single woman in sight.